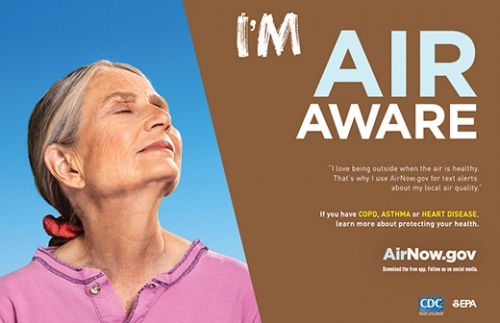 Better World Advertising (BWA), RTI International, and the Centers for Disease Control and Prevention (CDC), partnered to launch the public education campaign Air Aware. The goal is to raise awareness about the increased risk poor air quality poses to people living with chronic obstructive pulmonary disease (COPD), asthma, and heart disease, and to encourage them to use airnow.gov. Air Aware will run as a pilot-program in Pittsburgh, PA, from March 18-June 18, 2019. The priority population is individuals 35 and older living with COPD, asthma, and/or heart disease. BWA developed campaign materials, which were disseminated through banner ads, social media posts, outdoor ads (buses), and print ads (Pittsburgh Post-Gazzette). Visit airnow.gov to learn about your local air quality today.